from the candidates of (Barpeta, Bongaigaon, Chirang, Nalbari, Udalguri, Kokrajhar, Kamrup (Rural), Kamrup (Metro), Dhubri, Goalpara, Baksa, Darrang & South Salmara Mancachar Districts. Assam Recruitment rally will be held at 8 Assam Police Ground Abhaypuri, Bongaigaon, Assam from 04-02-2019 to 14-02-2019. Candidates with the age between 17 ½ years and 23 years (21 (Soldier GD) are eligible to attend for this Bongaigaon Army Recruitment Rally. Candidates who are willing to attend for this rally program have to register using the official website http://www.joinindianarmy.nic.in. Online Registration starts from 21-11-2018 to 31-12-2018. 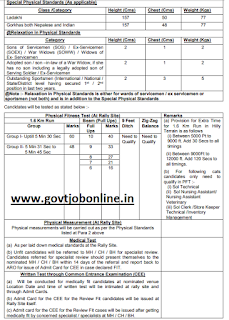 Selection process for this Soldier General Duty/ Tradesmen, Soldier Nursing Assistant/ Soldier Clerk/ Storekeeper Technical Jobs will be based on Physical Efficiency Test, Medical Test, Common Entrance Exam & Documents Verification. 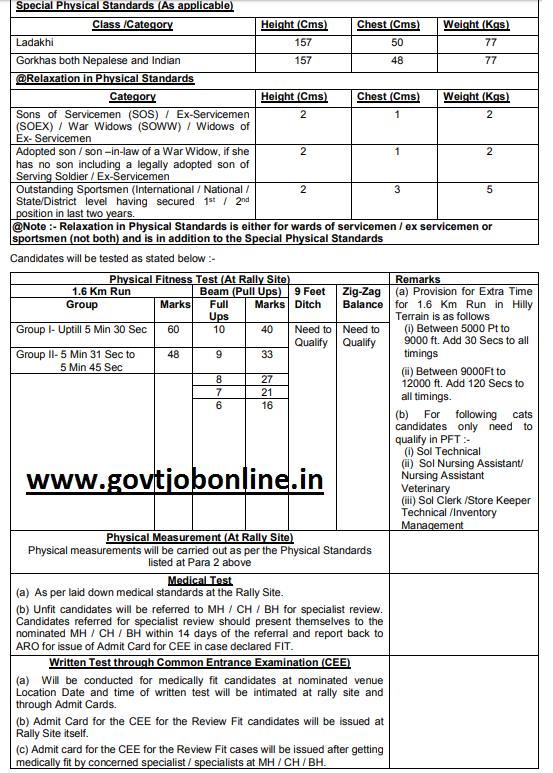 Further details regarding Assam Army Recruitment Rally Bongaigaon Soldier General Duty/ Tradesman/ Nursing Assistant/ clerk/ Storekeeper vacancies are given below. Recruitment Rally Starts from: 04-02-2019 to 14-02-2019. District Wise Recruitment Rally Details are given below. Age limit for Soldier General Duty is 17 ½ years to 21 years. Soldier GD: 10th class pass with 33% marks in each subject & 45% aggregate marks from recognized board. Soldier Nursing Assistant: 10+2/ Intermediate pass with compulsory subjects such as Physics, Biology & English and 50% aggregate marks. BSc with Botany/ Zoology/ Bio Science & English. Soldier Technical: Intermediate/ 10+2 pass with Science subjects (Physics, Maths, Chemistry & English) with 50% aggregate marks. (OR) Diploma in Mechanical/ Electrical/ Computer Science & Electronic & Instrumental/ Automobile engineering from recognized ITI/ Polytechnic Institute. Please see the official Notification for detailed qualification info. Recruitment Rally for Soldier Jobs will be held at Bongaigaon district is based on following stages. Group II: 1.6 kms run for 5 min 31 sec to 5 min 45 sec- 48 marks. 10 pull ups: 40 marks. 9 pull ups: 33 marks. 8 pull ups: 27 marks. 7 pull ups: 21 marks. 6 pull ups: 16 marks. Please see the notification for Physical Standards and relaxations. General Knowledge, General Science, Maths, Physics, Chemistry and from Computer topics questions will be given. Candidates with essential criteria are required to register for Soldier GD/ Tradesman Jobs by using Indian army official web link @ http://www.joinindianarmy.nic.in. The Process of registration starts from 21-11-2018. Last date for the application procedure 31-12-2018.